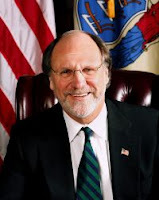 I spent a bit of time following Governor John Corzine’s condition this weekend. He broke his leg and a dozen ribs in a car accident Thursday night and has been in the hospital ever since. As details of the accident have emerged, we’ve found out that the drivers of the two pickup trucks involved will not be charged. One driver had pulled over to the shoulder of the Garden State Parkway, but swerved into traffic to avoid hitting a mile-marker. The driver of the second pickup pulled left to avoid him and hit the governor’s SUV, which hit the guardrail. But here’s the thing. Not only was Corzine in the front seat without a seatbelt. The SUV was going 91 miles per hour. State troopers transporting the governor can speed at their discretion in the event of an emergency. Whether this was an emergency is a bit dubious. It’s illegal to ride in a car without wearing a seatbelt. While it’s not against the law for state troopers to speed, there’s absolutely no reason anyone should be getting in a vehicle without buckling up, especially one that’s traveling at over 90 miles per hour. I personally refuse to drive anywhere if my passengers haven’t put on their seatbelts. I’m not saying the governor should be blamed for his accident. This isn’t about blame. But governor Corzine was seriously injured in this accident. His driver was hurt, but not so badly. It shouldn’t take such a high profile case to remind people they need to wear seatbelts, but I’m pretty sure this is one governor who won’t be getting in a car without one anytime soon.